A Geographic Information System, or GIS software, is sophisticated mapping technology that allows you to store, organize, sculpt, visualize and display location-based data so as to easily identify patterns that might have otherwise remained hidden. Data, left in its raw state, is feral. To find meaning within reams of facts and figures, it is imperative that have some method of intervening. That’s right, you need to find a way to tame your data. GIS software is the ideal way to do this. If used effectively, GIS programs can turn stacks of data-gibberish into clearly articulated mapped-out meaning. You got it: GIS software makes sense. The implications of this are vast. For businesses, it means quickly identifying areas of opportunity. It means deeply acquainting yourself with your market, knowing how to target your sales efforts, and being able to see if your hard work is paying off. But the advantages of this kind of effective data wrangling are not limited to the business world. The uses of GIS software extend to just about anyone — from academics to city planners, from public health officials to serious gamers. The reality is that if you have information in your life that would like to better understand, GIS technology can help you do that. In one of life’s greatest ironies, finding the right GIS software can be very difficult — it’s easy to get lost among the many available options. A capacity to handle huge amounts of data. Enterprise level solutions to your GIS software needs. Plus, we’re total geeks. Seriously. With apologies to anyone allergic to a bad pun, we gis can’t get enough of state-of-the-art data visualization. We’ve found mapping the most effective way to do this. We created our software because we know how powerful mapmaking can be to data sets large and small. If you would like to see what the buzz is about, you can sign up for our free trial. There’s absolutely no commitment on your part. We won’t even take your credit card details. Before we get too excited, let’s take a deeper look at what this miraculous technology really is. GIS programs are used to create maps and visual analyses of geographic information. Maptive’s interactive mapping software brings you an elegant platform that allows you to embrace the full capabilities of this evolution in mapping technology. You input your data into an easy-to-use inbuilt spreadsheet, and we transform that data into an interactive Google Map. It doesn’t end there, however. Once you have constructed your base map, the fun begins. Our suite of visualization tools allows you to take that data and mould it to reveal patterns, catalyze epiphanies and make it look so gorgeous you’ll be the envy of all your mapless friends. The uses of GIS Software are very S.A.D. What? Didn’t we just tout the merits of this miraculous technology? You’re right. GIS Software is far from sad. Its uses, however, definitely are. GIS programs allow you to store all sorts of geographical and spatial data. To comprehend how Maptive is able to do this, it’s important to understand our platform’s special relationship to Google Maps. Google Maps itself is a type of GIS software. Think of how much location data is already stored on its platform. You’re correct — a whole world full of geocoded detail. Our integration with Google Maps allows us to tap into that vast wealth of geographical information to bring you a platform that is powerful, organized and dependable. This means that the functions that are available to you on Google Maps are also accessible here. If you’d like to view your map in Street View, go ahead! If you’d like to get navigational instructions to counter your less than perfect sense of direction, that is available to you too. Standing on the shoulders of this kind of mapping giant means we are able to offer you a place where you can collaborate with the boundless swathes of information Google Maps already has its disposal. Think of GIS programs working as an exercise in layering. At the base level is Google Maps — and what a sturdy base to have. On top of that, our GIS technology adds all the tools to help you visualize your data with things like markers, boundaries and heat signifiers. These are the makers of those Aha! Moments about data that would otherwise have remained just a collection of words and numbers. What does this look like? Quite simply, you get to customize your map by inputting your own location data with whatever criteria are important to you. 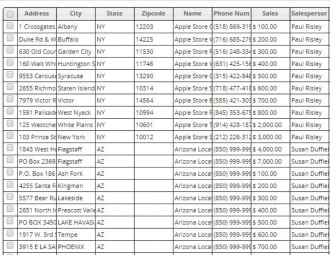 As you can see in the example below, it is important for this company to store sales information per salesperson. Perhaps they are looking to know more about the patterns in their sales conversion by area, or which salespeople are most effective in each zone. By inputting their location data into Maptive’s spreadsheet, in a matter of clicks, they will have their very own personalized map that will give them these answers. Now for the next exciting episode. Our GIS software allows you to save a base map and create various scenarios from it. This is useful if you quickly need access to a specific area of the map, want an enlarged version of a particular region, or would like to apply some of the GIS technology tools to certain map views but not to others. Maptive is entirely cloud-based. All that data you have stored will be available to you at any time of the day or night, no matter where you log on from. This saves you all the hassle of downloading and installing large GIS programs. Guess what? Because Maptive is 100% online, it also means you don’t have to grown wrinkles while you wait for the next update. Now that you have all your data stored, it’s time for the next step — finding out what all that data means. We don’t mean to brag, but it’s hard not to. 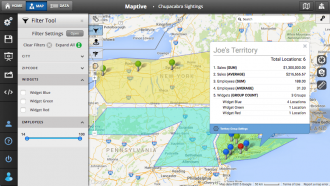 When it comes to data analysis, Maptive is a superior GIS software. Our tools for identifying trends and patterns are easy-to-use, highly sophisticated and fully customizable. Let you decide what information you want to see at a particular moment, and how you would like it organized. This is the first stop for anyone looking to bring meaning to chaos. Allows you to see patterns of density according to criteria important to your analysis. Creates visual boundaries on your map so that you can analyze subsets of numerical data by region to understand tendencies and identify opportunities. Exposes demographic census data on your map within a matter of seconds. Allow you to analyze spatial data by quickly determining distances between places, as well as get estimates of how long it may take you to get from one place to another. A dream for busy people who have multiple stops to make on a journey — optimizes the route between multiple locations so that you ensure you spend as little time on the road as possible. OK, we know. Your imagination is running amok with the many uses you have for our GIS technology. But wait, it gets even better. Wait until you get to the part where you get to show your map off. Did we mention that we love making beautiful maps? Did we mention that we also like to make them as customizable as possible? Did we let you know that GIS technology allows us — and you — to do exactly that? You get to pick everything from what your markers look like to the colors of the inner radius of your heat map. Want your markers to come in the form of your famous faces from Tinseltown? Simply upload the favorite faces as 70 by 70 pixel images and you’re off. Little Meryl Streeps and Christopher Walkens will soon be staring back at you from your map. Or maybe you would like to relive that artistic career of yours that ended in Mrs Smith’s Grade 2 art class. Now’s your time. Choose the colors of your routes, your boundaries and the regions you demarcate. You can even choose your overall map style. Perhaps a little sepia for a vintage look? What’s more, you have full control of what part of your map you would like to display. Specify the area and how zoomed in or out you would like to be. Go to your map settings and decide whether you would like to hide certain roads or waterways. Do you want to display the names of cities and counties or would you prefer to leave this blank? And then there’s our map drawing tool. You’re going to love this one. You get to put your stamp on your map by adding things like text bubble, shapes, icons and labels. In each case, it’s your prerogative whether you share the base map or specific regions or views. You get to set the privacy levels of each map. It’s up to you who sees what. Whether you would like to create a store locator and directions to your place of business, highlight a trend for your target audience or use your map to give a presentation at a conference, how you display your map is entirely up to you. As you can see, like an actor playing Eeyore in a the hit musical of Winnie The Pooh, in this context S.A.D. is good. Now that you know what GIS software is, it’s time to find out who it is for. Who is GIS Mapping Software for? We’re going to let you in on a little secret — a GIS mapping app can be useful to just about anyone. From a ten year old looking to create a school project that will win a prize in the science fair to a high-level researcher wanting to map complex data, if you’ve got information that you would like to understand, GIS software can help you do it. To give you some ideas, here are some of the people who have made very good use of GIS technology. Ready to meet the GIS software users. Here are just a few of them. GIS programs are a marketer’s dream for multiple reasons. The insights that mapping visualization is able to provide allow marketers to understand patterns based on various factors ranging from average income in a particular area to density of a certain demographic. It’s not hard to see how this is gold for marketers. They can quickly identify where to focus their efforts. Added to this, with our ever-growing addiction to mobile technology has come new avenues for marketers to target potential customers. Location based marketing is becoming increasingly popular. Marketers are able to use the location information from mobile phones to make sure that they advertise relevant services to future customers. GIS software has made this possible. Whether you are a Mom ‘n Pop shop on the corner selling parents to local passersby, or a huge insurance corporation, you cannot afford to be without GIS technology in your business. The uses are almost limitless. You may have extensive data that you need to understand. If you looking to expand, you may want to know where global business opportunities lie. Or you may simply want to show people where your offices are. We’re hoping you’ll use our GIS software to do all of it. Once you implement it, you’ll wonder how you ever managed without it. Like the mobile phone. Or internet streaming. Or the word LOL. If you are a salesperson, you more than likely spend a fair amount of your time traveling from one potential customer to the next. If you haven’t yet embraced GIS software, you more than likely spend a lot of time programming maps or worse — asking for directions. The navigational capacities of GIS technology will make all of that a thing of the past. Simply program the locations you need to hit into your map, and the route planner [EMBED LINK TO ROUTE PLANNER] will make sure you get there as efficiently as possible. Looking to see if you should open a new branch of Rooster Booster’s Chicken Juice in a specific location? By using our GIS mapping app’s proximity tools, you can easily identify if the new location is too close to any of the others. Rather than spending hours on time-consuming research, you can simply click a button, and our GIS technology will reveal all. Can you imagine if GIS software was around when they started building all the world’s great cities? Let’s just say that if that were the case, we might just live in the most organized cities in the world. Well, it’s not too late. Urban Planners now make use of GIS software to make informed decisions on important issues that affect the lives of all a city’s inhabitants. While we’re on the topic of housing and development, many real estate agents are already using GIS software in many spheres. GIS technology helps them quickly identify market trends, understand demographics of particular areas, and see the distance between locations. What’s more, we all know what displaying our beautiful maps on your website can do for business. GIS software allows those who create and administer public health policy to quickly identify threats to public health. By tracking and analyzing data such as the number of infected people in an area, they can deduce what the best steps forward are in terms of policy creation and implementation. It’s not hard to see how researchers in any field can make good use of GIS software. The effective use of GIS programs lets academics shave hours off their research processes, allowing them to quickly identify trends that may have otherwise remained hidden. Whether our maps are used in the social sciences to understand human behavior, in the biological sciences to understand plant and animal density in a particular region or — imagine this — in the geography department, faculties in every school should have access to GIS software. We know. By this stage, you’ve probably decided how you are going to employ GIS technology in your life. 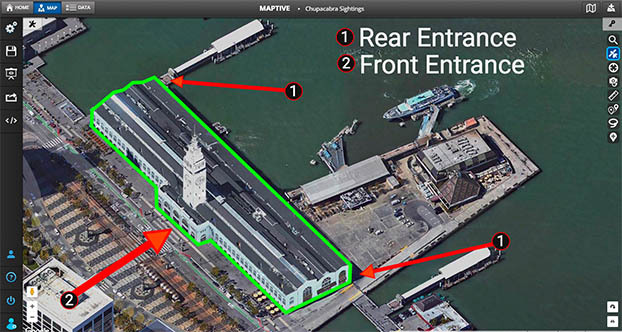 To whet your appetite further, let’s recap some of the features Maptive’s GIS software has to offer you. Geocoding is the transmutation of physical, real-world locations into geographic coordinates so that they can be represented on a map. Because Maptive is powered by Google Maps, our maps make use of the most sophisticated geocoding available to online mapping. Remember those tools we showed you that allow you to quickly see where one location is in comparison to another? That is what we call spatial analysis. Our GIS software has multiple spatial analysis tools, ranging from the radius tool that creates a radius of certain distance around a central location, to the Drive Time Polygon that shows you how long it will take to travel between highlighted locations. GIS software allows you to create maps that contain layers upon layers of location-based data. This allows you to gain complex insights into geographical and spatial issues. Added to this, layering gives the user added agency when it comes to how they want to use their maps. If you would like to export an aspect of your data but not all of it, the layering process allows you to do this. We only mentioned how beautiful our maps are about 56 times. It’s probably time to say it again. Data never looked this good. But GIS software is about more than just creating a pretty face. Visualizing data allows you to understand it. Patterns emerge that were previously invisible to the eye. Once you can see them, you can do something about them. To be honest, this the thing that we love most about our GIS technology — it’s yours to with as you wish. We are constantly amazed at the creative uses of our platform, with many of our customers surpassing our own expectations of what we thought possible. From bold aesthetic choices to the many industry uses of our product, GIS software makes so much sense. We want to see what you will do with it. 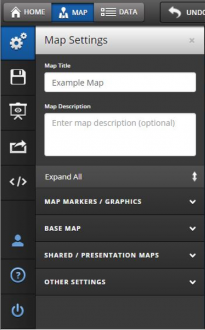 Ready to try Maptive’s Free GIS Software? We have a free trial for you. It’s completely free. Not free-but-actually-there’s-a-catch. Not free (if you give us your first born child or your best kept secret.) But free free. You don’t even have to give us your credit card details. If you think our GIS software will be a good fit for your company, head on over to the plans we have on offer. We can hear the sound of all those little epiphanies waiting to be born as you go on your journey with our GIS software.